Between 1855 and 1867 companies like Russell, Majors, and Waddell shipped millions of pounds of freight across the plains to supply military posts and mining camps to the West. After 1861 freighters followed the "Nebraska City-Fort Kearney Cut-off" instead of the longer "Ox-Bow Trail," which looped north along the Platte River. The new route crossed York County in a northwesterly direction. Road ranches were established along the trail, where provisions, livestock, and lodging could be obtained. Porcupine Ranch was the first of five road ranches in York County. Situated at Porcupine Bluffs on Beaver Creek near the western border of the county, the ranch was established in 1863 by Benjamin F. Lushbaugh, Agent to the Pawnee. During the 1860's the ranch provided water and supplies to thousands of emigrants and freighters. It was also a relay station for the Overland Stage Company, which carried passengers and mail. With the completion of the transcontinental railroad through the area in 1867, emigrant, stagecoach, and freighting traffic declined. Porcupine Ranch and other road ranches were soon abandoned as towns grew up along the railroad. 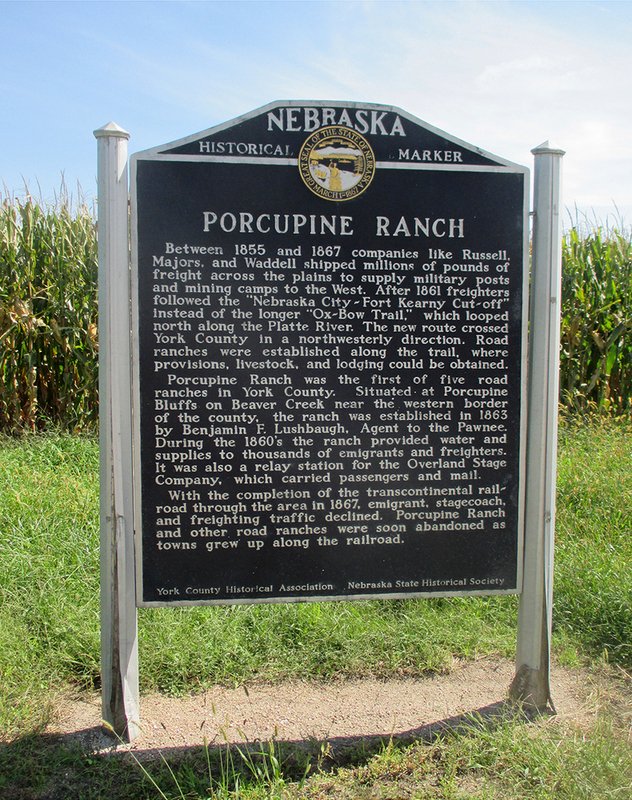 “Porcupine Ranch,” Explore Nebraska History, accessed April 18, 2019, https://mynehistory.com/items/show/542.